MISSION, KS--(Marketwired - Dec 5, 2013) - (Family Features) Sometimes even the smallest changes can offer big results to your overall well-being. When maintaining or pursuing a healthful eating routine, adopting a balanced approach is essential for success. Rather than restricting yourself, strive instead to make small steps toward a healthier lifestyle. A few simple changes to your daily routine can eventually turn into lasting habits that are far more enjoyable and easier to maintain. Food is fuel. In order to keep energized throughout the day it is important not to skip meals. Grab a midday snack, like The Laughing Cow Light White Cheddar flavor with whole grain crackers, to help you overcome that all too familiar late afternoon slump. These cheeses are a must-have for your January shopping lists. A little healthy yet tasty fat, such as 1/4 of an avocado or a handful of almonds, can go a long way. It can provide flavor, satiety and be good for your body, especially your heart. To help ensure healthier choices are made when dining out, be sure to grab a quick, tasty snack to tide you over before your meal. 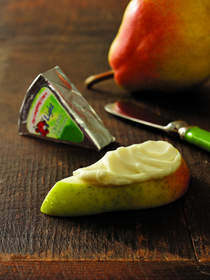 Some great snacking options include a wedge of The Laughing Cow Light Creamy Swiss flavor with pear slices, a low-sugar granola bar or 1/4 cup of roasted edamame. The less hungry you are, the easier it is to stay on track. For more great snacking tips, visit www.thelaughingcow.com. Want that slice of pizza or piece of chocolate? Go for it. To maintain a healthy and enjoyable lifestyle, try and eat well the majority of time, but make sure you leave room for some of your favorite indulgences. If you don't allow yourself to enjoy these foods on occasion, you might always be craving them, which can lead to overeating. It is never necessary to eliminate the flavors you love, instead learn to enjoy them in a healthier way. Are you in the mood for nachos but trying to eat a little better? Swap the high-fat cheese and greasy fried chips for a wedge of The Laughing Cow Light Queso Fresco & Chipotle with a serving of baked tortilla chips. With eight delicious varieties to choose from, this cheese is the perfect snack to satisfy your cravings in the New Year. So, enjoy all the flavors and fun of life by adopting a small-step approach toward eating well. Each tiny change is a step in the right direction to a happier, more satisfied you.